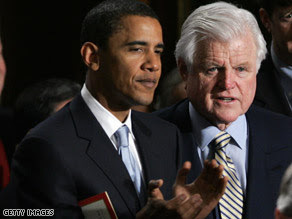 U.S. Sen. Edward Kennedy, the Democrats' leading liberal voice, is endorsing Barack Obama for the party's presidential nomination on Monday while a new poll found Republican John McCain with a slim lead on the eve of a crucial Florida nominating contest. Obama, who trounced fellow Sen. Hillary Clinton in South Carolina's primary on Saturday, also won the backing of Kennedy's son, U.S. Rep. Patrick Kennedy, and his niece, Caroline Kennedy, daughter of the late President John Kennedy. Having the Kennedy’s endorse Obama is a massive slap in the face to the Clinton’s and gives Obama a profile that is almost starting to border on the mythical – I’m waiting for him to pull a sword out of a stone soon, the Kennedy’s have massive pull amongst the Latino and white liberal vote, the exact groups that Obama needs to appeal to if he is to get the wider support that will carry him through to the November elections. His victory speech at the South Caroline election was certainly the closest I’ve ever seen any US politician get close to the Kennedy ability to inspire, Obama could be the real deal. Would love to see him do it, but can't see it. The fact that Hillary labels herself as a new candidate of change is laughable...wife of the ex-president, who even described it as a 2 for 1 deal when he got elected...and Senator for New York...haha about the biggest "establishment" candidate there's been. The sooner Edwards backs out the better as he's hurting Obama and helping Hilldawg at present.